Published: Oct. 6, 2014 at 12:08 a.m. Updated: Oct. 7, 2014 at 01:01 p.m. The waiver wire is one of the most important keys to finding success in the world of fantasy football. Each week, I'll offer up 10 players you need to target off the free-agent market as you look to reach your ultimate goal - winning a league championship! And if all 10 of these players are already owned and you need a deeper look at some waiver-wire options, be sure to check out our weekly deep-dive waiver wire targets. First it was Ryan Mathews. Then Danny Woodhead. Now, the Chargers have another injured running back, Donald Brown. Enter Oliver, who wasn't on the fantasy radar in drafts but is now a prime waiver-wire pickup. At 5-foot-7 and wearing No. 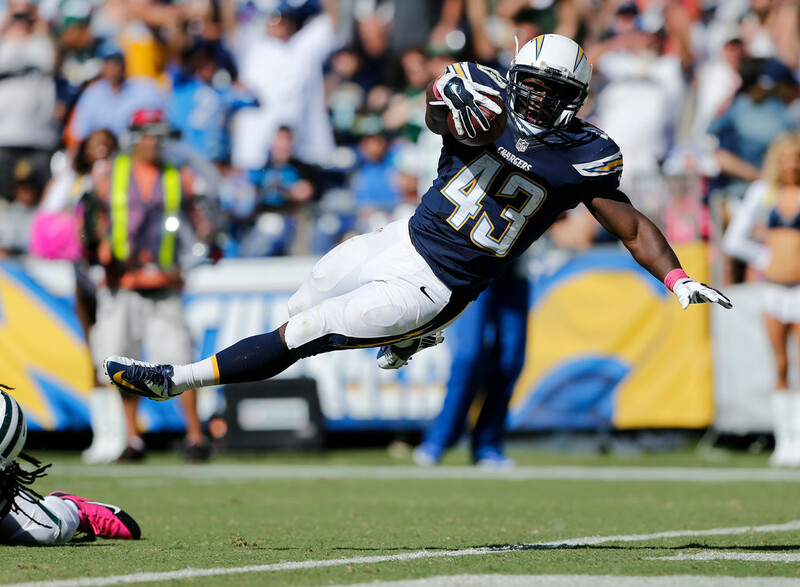 43, he's going to draw comparisons to onetime Bolts runner Darren Sproles. In Week 5, Oliver went off for 182 scrimmage yards, a pair of touchdowns and a terrific 29.20 fantasy points. Rashad Jennings suffered an injured knee that kept him out of action during the second half of Week 5, so Williams has become a must-add running back across the board. The rookie out of B.C. looked solid in Jennings' absence, rushing for 65 yards with one touchdown and 14.30 fantasy points in a win over the Atlanta Falcons. Williams would be a viable No. 2 fantasy runner if Jennings were forced to miss Week 6. Injuries were rampant in the NFL this week, and Montee Ball couldn't escape it as he suffered a groin ailment that kept him out of a good part of Sunday's game. Should the Wisconsin product be forced to miss playing time, Hillman would become a legitimate flex starter in standard and PPR formats. He put up 63 yards on 14 carries in Ball's absence in a win over the Arizona Cardinals. Quick was listed in this space last week, but he's still a free agent in over 70 percent of NFL.com leagues. That should change, though, as he went off for five catches, 87 yards and two touchdowns in a loss to the Philadelphia Eagles. Quick has now found the end zone a combined three times in his last two games. He's also scored nine-plus fantasy points in all but one of his four starts on the year, so this is no fluke. I have listed Allen in this spot for weeks, but he's still a free agent in over 60 percent of NFL.com leagues. So ... I'll put him here one more time and see if that number decreases. In Week 5, Allen posted 59 yards and one touchdown in a win over the Baltimore Ravens. He has scored a touchdown in three straight games and five of his last six. If you need a tight end, this is your last chance to get him. Kelce posted a mere 15 yards against the San Francisco 49ers in Week 5, but he did score a touchdown and put up a respectable 7.50 fantasy points. He's now found the end zone in three straight games, and has recorded at least 7.50 fantasy points in each of his last four contests. When you consider how thin the tight end spot has become it's hard to fathom Kelce still being a free agent in so many leagues on NFL.com. Zac Stacy was forced out of action in Week 5 due to an injured calf, and Cunningham was solid in his absence against the Philadelphia Eagles. He put up 47 yards on seven carries, scored on a 14-yard run and posted 13.10 fantasy points. In the event that Stacy is forced out of action due to the ailment, Cunningham would have some flex-starter appeal. The Rams next face the San Francisco 49ers on Monday Night Football. Bridgewater missed last week's game against the Green Bay Packers due to a bum ankle, but he's expected to return in time for Week 6. And while a matchup against the Detroit Lions isn't favorable on paper, the rookie is still worth an upside waiver-wire add if you're in need at the quarterback position. In his lone start of the year to this point, Bridgewater went for 317 yards, one touchdown and a solid 23.38 fantasy points. In the category of it's "better late than never," Hunter awoke from his statistical slumber to post 99 yards, one touchdown and 15.90 fantasy points in a loss to the Cleveland Browns. A talented playmaker who was a preseason darling in countless fantasy football drafts, one has to wonder if this is the start of some good things to come soon. If Hunter is a free agent in your league, add him now and see if he remains en fuego. It's impossible to ignore Smith at this point, despite the fact that he doesn't see a ton of touches in the Falcons offensive attack. Over his first five games of 2014, he's scored nine or more fantasy points four times. That includes a 14.50-point performance in a loss to the New York Giants in Week 5. Smith isn't going to become a must-start runner this year, but the man makes plays on the gridiron ... that's obvious.